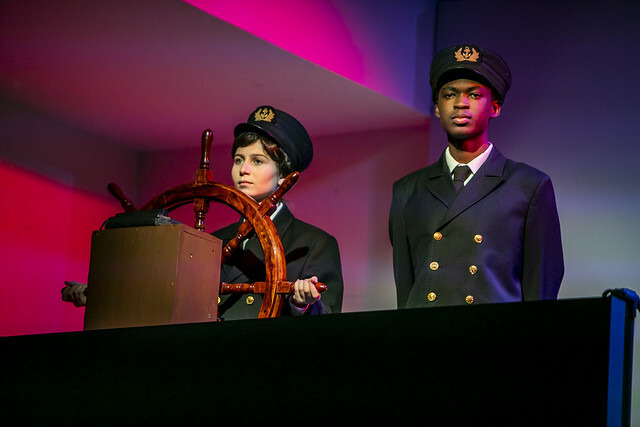 The Thespian Society invites you to set sail on the maiden voyage of RMS Titanic, “The Largest Moving Object in the World.” This musical tells the tragic story of the ill-fated maiden voyage, and what led to the sinking. There have been many different tellings of this story. Two famous movies are “A Night to Remember” (1958) and James Cameron’s “Titanic” (1997). This stage musical actually premiered seven months before the Cameron movie in 1997 and won five Tony awards. The plot features the relationship between the captain, the builder, and the owner of the ship, as well as the historical figures among the passengers and crew. While our story does not feature “Jack and Rose” story from the Cameron movie, it is sure enthrall our audiences. Join us for the maiden voyage! Tickets $10 ($5 for students). Click here to purchase tickets.